ExtCalendar is an open-source calendar application, with an integrated event managemt system. 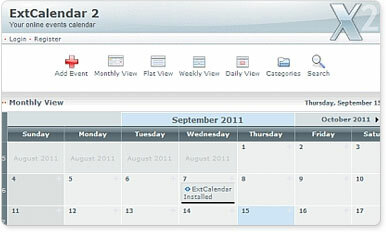 ExtCalendar is a powerful multi-user web-based calendar application. Features include Multi-Languages, Themes, Recurrent Events, Categories, Users and Groups management, Environment and General Settings, Template Configuration, Product Updates. ExtCalendar is released under the GNU GENERAL PUBLIC LICENSE.